I've previously reviewed OMG nail strips and I've tried a few brands of strips over the last year. 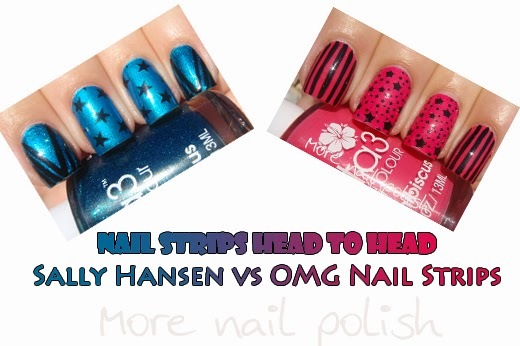 I recently got the opportunity to do a comparison review between OMG Nail Strips and Sally Hansen Salon Effects. This time I actally put them to a wear test and I continued to wear one of each nail strip on a finger on my 'cinderella' hand for a whole week. Let me share my results. First up, Sally Hansen Salon Effects nail strips. I was provided with a pack of metallic blue strips with black stars. 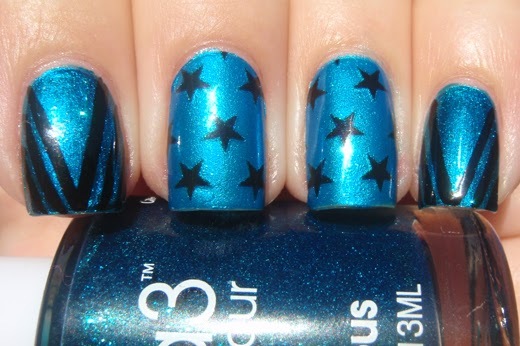 Now I've always said that personally, I wouldn't purcahse a nail strip design in something that I could easily stamp, and both these nail strips are exactly that. 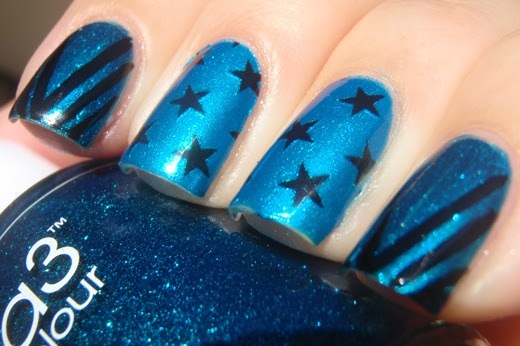 I could achieve this look with a black stamp over a single base colour. But I know there is a huge percentage of people out there that don't stamp, and would find all of the designs on nail strips something special that they couldn't otherwise create. Rather than wear a full mani of the strips, I thought I would mix it up a bit with some other designs. I used the nail strips on my middle and ring fingers, and my thumbs. On my index and pinky I painted a base colour using Kleancolor Metallic Aqua. It wasn't the exact matching shade for the polish so I layered a thin coat of Ulta3 infamous, which provided just the right aqua coloured tint (with a bit of glitter sparke). I then did some free hand lines using black polish and a striping brush. For my second mani, I tested out the OMG Nail strips. The strips I was sent were bright pink with black stars on them. 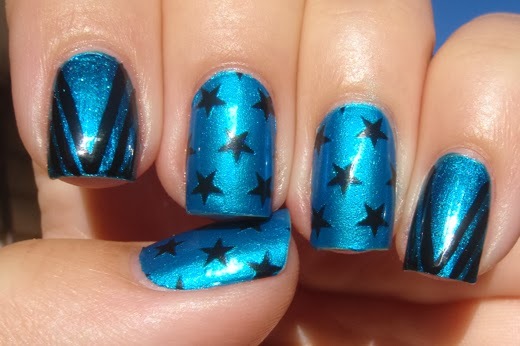 Again, rather than wearing a full mani of the strips, I mixed it up a bit with some other designs. I used the nail strips on my middle and ring fingers, and my thumbs. On my index and pinky I painted a base using Ulta3 Pink Hibiscus (seriously this was an exact match to the nail strip colour). I then added vertical stripes using black polish and a striping brush. Now to the wear test. Let me tell you that wearing one pink and one blue nail on your right hand for a week, where it doesn't match the rest of your fingers, really does make people comment. Comments included "Did you run out of polish? ", "Did you forget those two fingers?" and "What's going on with those two?" as well as the people you catch staring at your nails who don't say anything, but are clearly thinking you are starting to loose your marbles. I photographed my two nails every day at the same time, and these photos progress through from one day of wear, through to after a full sveen days of wear. I reapplied top coat to the nails ever second day and you can clearly see the nail growth at the cuticle edge. Wear wise, I found both brands to be really excellent. At about day four, both brand strips got a little chip of polish come off on the corner of the nail, but as you can see, you can't tell in these photos because of the c-curve of my nails. The Sally Hansen ones might look a little better at day 6 but they were very similar at day 7. I'm talking less that half a millimeter here in total tip wear! I seriously don't know how anyone can go a full week before changing their polish. It's not only the tip wear that gets me, but also the massive gap at the cuticle edge from where the nail grows. But as far as the overall look of the polish on the nail, even after day 7, both of these brands fared very well and I would confidently recommend both of them. As far as a price comparison, here is an updated comparison for some popular brands, and others that I have tried. I'm hoping to trial some Incoco Nail strips in the near future and I will do a wear test on those to include with the above brands. OMG Nail strips are available from the OMG Nail Strips website. Do many of you wear nail strips? If so, do you use the whole packet and put them on all nails, or do you mix it up so you can try to get two manicures out of a packet of 16 strips? Nail polish strips provided for consideration. Nice review and I like the look of the OMG Nail Strips! 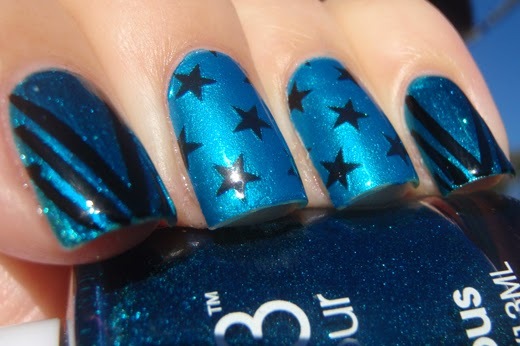 I find them being a bit expensive, considering you can achieve the same with just nail polish and stamping.